This dinky little guide book is perfect for anyone already familiar with Amsterdam who wants to see more, and feast as they go. If you’ve seen the sights, visited the museums and experienced the delights of this fair city – and you enjoy troughing, then Walk & Eat Amsterdam is a bit of a treasure. Food writer, Cecily Layzell has produced a: light-hearted introduction to Dutch cuisine and eating habits, and combined it with different walks (including a night yomp), in and around the capital. Every stroll takes in a different part of the city, or further afield to the North Holland Dune Reserve, listing authentic Dutch eateries and watering holes along the way. If you’re short on time or energy, there are 11 walks of varying distance to choose from, but nothing requiring mountain goat levels of fitness. Layzell has even gone to the trouble of including a traditional Dutch recipe at the end of each chapter, which could have been its undoing (if you’re familiar with normal Dutch cuisine), but this just adds charm to an already appealing little book. There is plenty of useful advice about planning your visit including useful transport information and websites, as well as some handy translation for Dutch menu items and everything is presented in a cheerful and easy to read format. 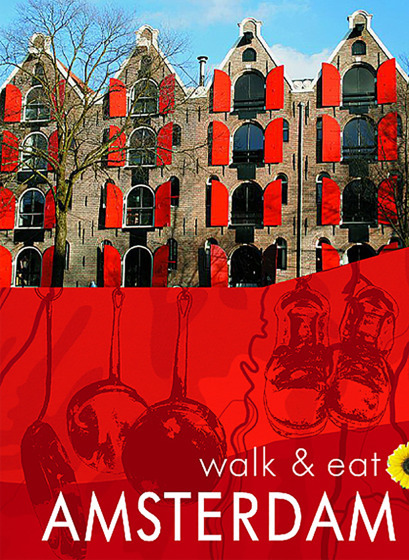 Walk & Eat Amsterdam is a lovingly researched pocket guide and the ideal travelling companion for long-term residents and expat foodies looking for a new and edible dimension to a day out in the capital.